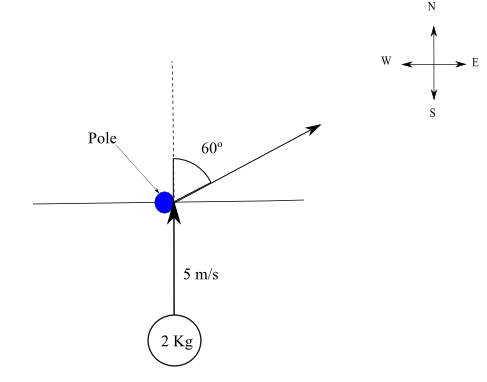 Linear momentum questions with solutions and explanations at the bottom of the page. These questions may be used to practice for the SAT physics test. If the speed and mass of an object are doubled, which of the following is true? Two object A and B of velocities v1 and v2 have momenta with equal magnitude. If |v1| < |v2|, which of the following is true? Two objects A and B have velocities v1 and v2 and masses m1 and m2. If |v1| < |v2| and the two objects have equal kinetic energies, which of the following is true? How long does it take a 2000-Kg car to stop from a velocity of 35 m/s if a braking force of 4000 Newtons is used? Object A of mass m1 is moving at a velocity v1 to the right. It collides and sticks to object B of mass m2 moving in the same direction as object A with a velocity v2. After collision, the two objects have a velocity equal to (1/2)(v1 + v2). What is the relationship between m1 and m2? An object of mass 4 Kg is moving towards the east at a velocity of 6 meters per second. It collides and sticks to a 6-Kg object moving with a velocity of 5 meters per second in the same direction. How much kinetic energy was lost in the collision? Two objects A and B of masses 1 and 3 Kg are held by a compressed massless spring and are at rest. When the spring is released, object A moves to the left with a velocity of 9 m/s. What is the velocity (magnitude and direction) of object B? A) In an elastic collision, only momentum is conserved. B) In an inelastic collision, both momentum and kinetic energy are conserved. C) In an elastic collision, only kinetic energy is conserved. D) In any collision, momentum is conserved. E) In any collision, both momentum and kinetic energy are conserved. An object A of mass m1 is moving at a speed v1 in a straight line to the right. Another object B of mass m2 is moving to the left in the same path as object A but in the opposite direction. What would be the speed of object B be so that when the two objects collide they stick to each other and stop? P = M V = (2m)(2v) = 4 m v momentum is quadrupled. F Δt = Δp = m (vf - vi) , vf final velocity and vi initial velocity, Δ t is the time during which force F is applied. |F| Δ t = m |vf - vi| , assuming vf and vi either in same or opposite directions. 1.2 J of kinetic energy was lost. We assume an object moving to the right is moving in the positive direction. Assuming positive motion when an object moving to the right. Since both objects moving along a straight line, the velocities have one component along the path of motion which a straight line and this component is either positive (to the right) or negative (to the left). momentum before collision: p1 = m1 |v1| - m2 |v2| , |v2| the magnitude of object B.
momentum after collision: p2 = 0 (they both stop hence velocities equal to 0 after collision).